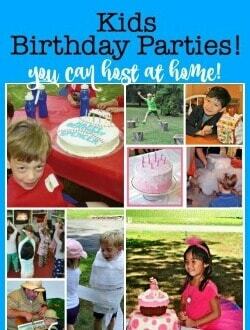 We love to plan fun kids birthday parties that we can host at home that allows our birthday child to celebrate with their friends- and don't cost us a fortune! 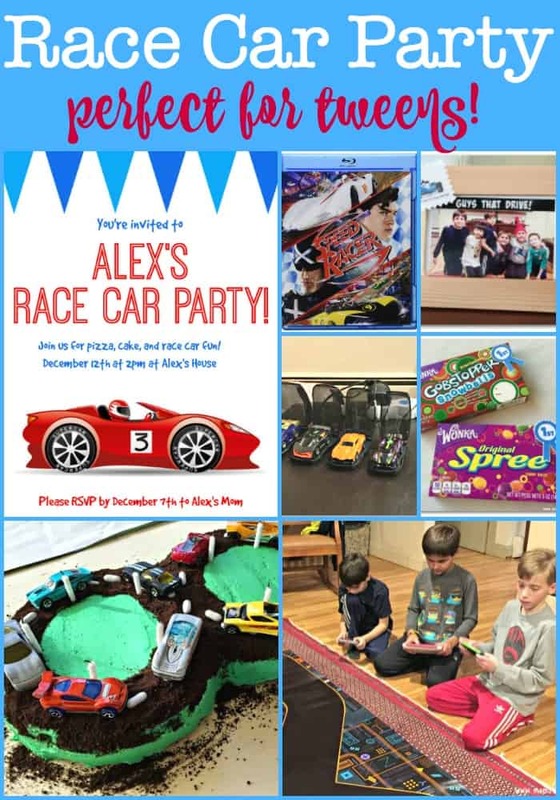 And this race car birthday party is just perfect for tweens who love cars and technology! 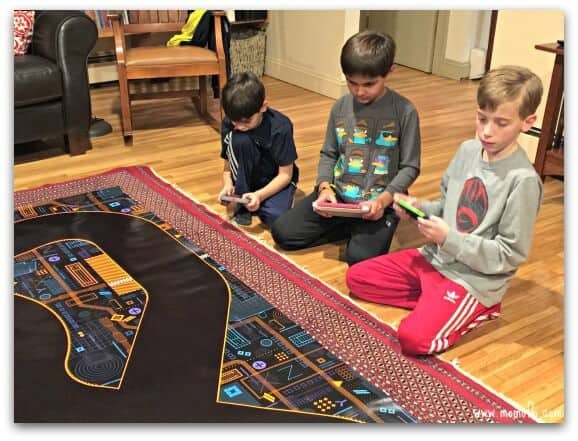 Have you ever been to one of those slot car racing places- where kids get to choose their car and participate in planned races against their friends on the huge elevated track that twists and turns around the room? It's a ton of fun! But when you plan to take 12 kids to a slot car racing place for a birthday party- it can get kind of expensive. And there's the logistics of getting all of the kids to/from the party. Plus when the party is over and you leave- the slot cars and the cool track stay behind. You'll have to pay a fee to go there and play with them again. Wouldn't it be cool if there was a way to have this same experience at home? With awesome race cars and a track that you play with over and over again? Well, you can- with Anki Overdrive This is an affiliate link: MomOf6 earns a commission if you purchase, at no additional cost to you. ! 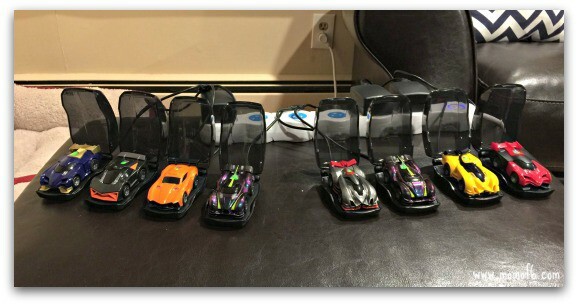 Anki Overdrive This is an affiliate link: MomOf6 earns a commission if you purchase, at no additional cost to you. is this cool high-tech magnetic track with smart car technology that is really impressive. 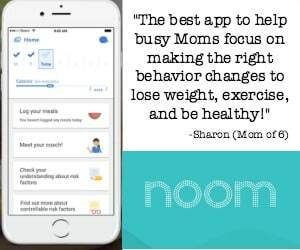 You use your smartphone or tablet with the free app to control your car, and as you play you earn points which allow you to “upgrade” your car’s abilities- such as being able to do U-turns and sudden stops or improve your car’s armor or shooting abilities. Each Supercar is a self-aware robot, driven by powerful artificial intelligence. Whatever track you build, they'll learn it. Wherever you drive, they'll hunt you down. The better you play, the better they become. A start kit will set you back around $100 (which is still less than what it would cost me to take 12 kids to a slot car racing venue). But a kit only comes with 2 cars, which isn't too party-friendly. We purchased additional expansion cars This is an affiliate link: MomOf6 earns a commission if you purchase, at no additional cost to you. so more kids could play at the same time. 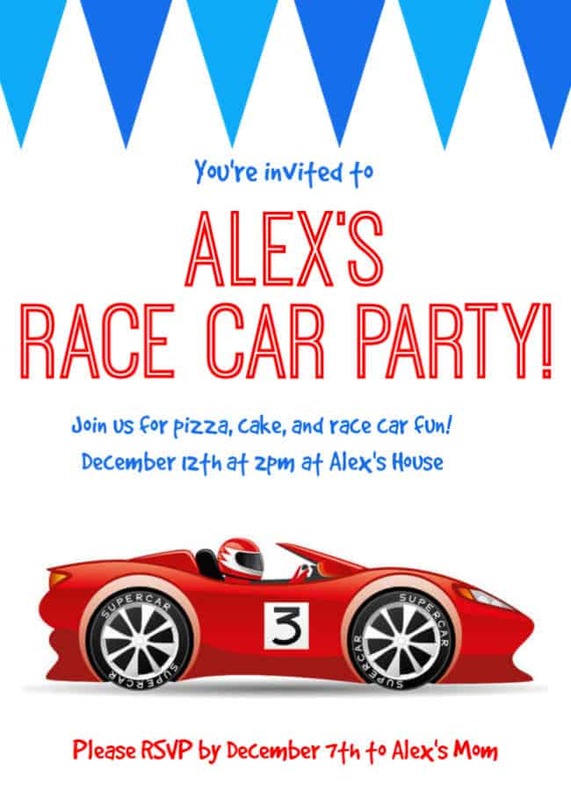 I designed these race car birthday party invitations, which I emailed to party guests. Alex really wanted to have a sleepover party this year, but since not all kids are ready to sleepover at a friend's house or some might have an early morning commitment the next day- I always give guests the option to stay or not, and let them know an evening pick up time for those guests not sleeping over. I created a blank version of the invite which you will find at the end of this post! We moved the couches back in our family room so that we had room to roll out both race track mats on the floor. 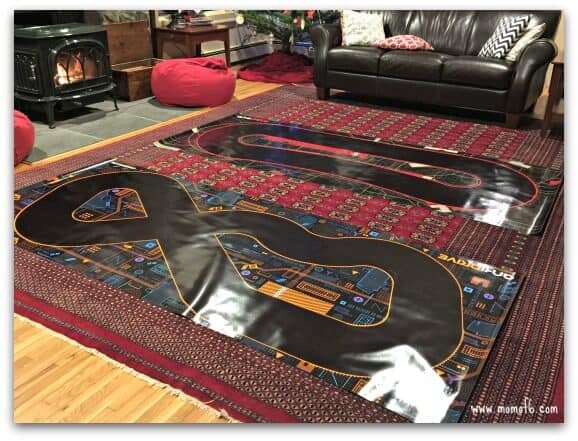 (Note: the version of Anki overdrive we purchased came with roll-out mats- the current versions come with magnetic tracks you put together). We asked the kids to sit on the outside of the tracks (no one in the middle and no one on the ends) so they could see everything when they weren't racing. And we made sure to tell the kids not to step on the race mats. We set up all of the cars with their respective charging stations on an ottoman using a power strip to provide the juice. 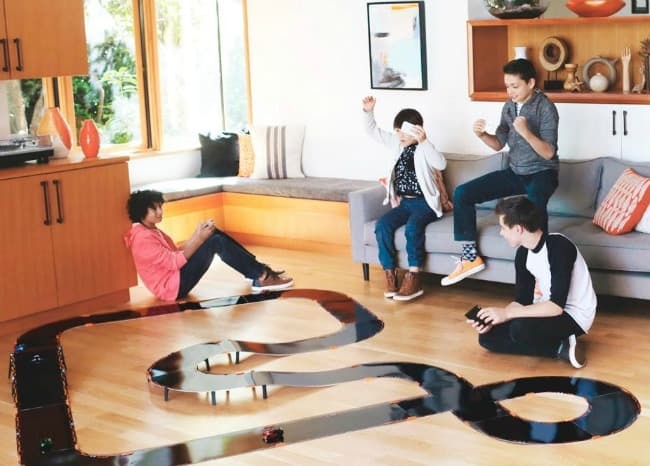 Now before the party, you'll need to spend some time watching the Anki Drive “How To” videos so you understand how the cars work and how to race. 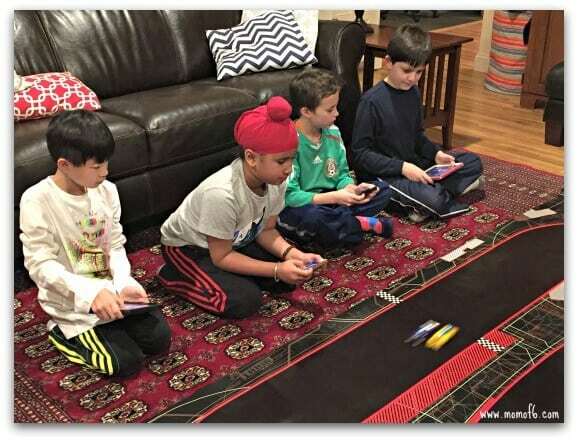 My husband and three older boys practiced for two days until they felt comfortable that they could teach the kids how to race their cars fairly quickly during the party. You'll need a smartphone to be paired with each one of the cars- because you race your car using your phone. (Anki currently works with devices that can download apps from the Apple store, Google Play, and the Amazon App store). 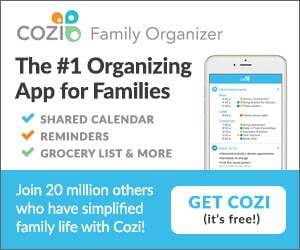 I think that one of the keys to a successful sleepover party (for you, the host!) is to limit the evening and morning hours for the party. We normally start our sleepover parties at 6:30 pm and begin with dinner. This allows the guests to settle in a bit before we move on to the party events. I also prefer a pickup time of 9:30 am the next morning. Because even though the kids will stay up late- that doesn't mean you can count on them sleeping in! And by the time you serve breakfast and help them pack up their things- you are usually ready for the party to be over! 6:30 pm- Guests arrived and ate pizza together for dinner. 7:00 pm- Racing “lessons” using the cars and the tracks. Each guest was taught how to race their car and given lots of time to practice. We held several practice races as well. The cars were then returned to their charging stations. 8:00 pm- Racing events. Because we had two different tracks (an oval and a figure-8), we held three races on each track. The first two races allowed all of the party guests to race once. 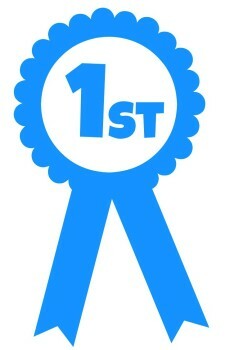 The top two winners of these two rounds raced in the final round (only 4 cars can race on a track at a time). 8:45 pm- Break to put away the race tracks and set up for the movie, pop popcorn, etc. 9:00 pm- You gotta pick a movie to fit the theme, right? 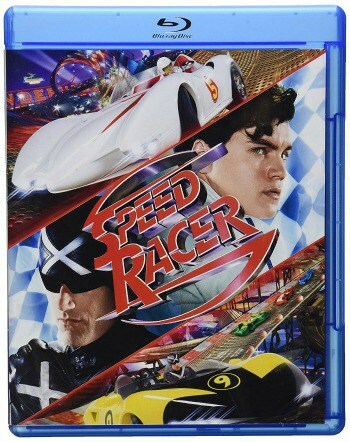 We chose “ Speed Racer This is an affiliate link: MomOf6 earns a commission if you purchase, at no additional cost to you. “! 10:30 pm- Movie over- pickup time for the guests not sleeping over. Guests staying changed into their pjs, and set up their sleeping bags in our finished basement. 6:30-7:00 am- Kids woke up (a ridiculously early time- but they were up!). Rolled out the Anki tracks again and let them race while we made breakfast. 8:30 am- Breakfast served (homemade waffles, bacon, juice, fruit). 9:00 am- Kids get dressed, pack up stuff, play basketball outside. 9:30 am- Parent pick up. This cake was super simple to make. It was just two round cakes made from a cake mix. I sliced off a sliver on the end of each round cake and pushed them together on cake display board. Iced the entire thing in green icing. 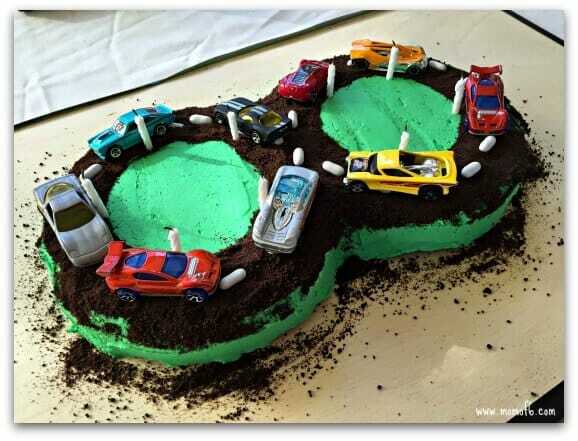 Then I cut out two medium-sized circles on paper and placed the paper circles in the middle of each round cake- this protected the green icing while I created the race track. Using a rolling pin, I crushed the chocolate cookie from a sleeve of Oreos (discarding the filling) in a zip top bag, and then sprinkled the cookie crumbles onto the cake- creating the figure-8 track. I used white good-n-plenty candies to make the lines on the road and then placed some Matchbox cars and candles on the top of the cake. I think that kids love to have pictures of their friends in their bedrooms- so I like to take photos of the birthday party guests as a group and make that the party favor at our parties. I had the kids line up for the group shot- and then I edited the photo in PicMonkey This is an affiliate link: MomOf6 earns a commission if you purchase, at no additional cost to you. to include the tagline “Guys that drive!”. I then printed the photos on our home printer while the kids were watching the movie. 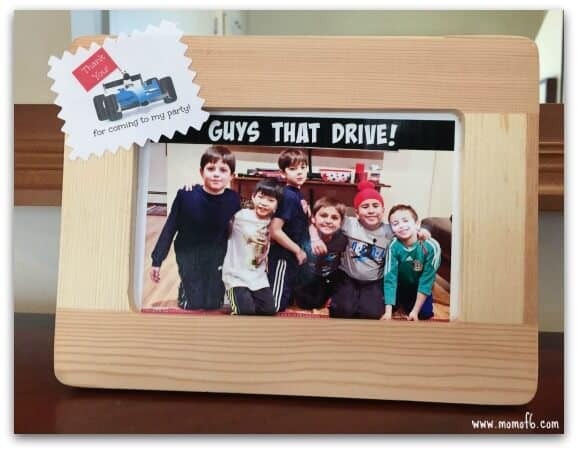 I placed the pictures inside of these cute wooden frames This is an affiliate link: MomOf6 earns a commission if you purchase, at no additional cost to you. , and I added the favor tag. 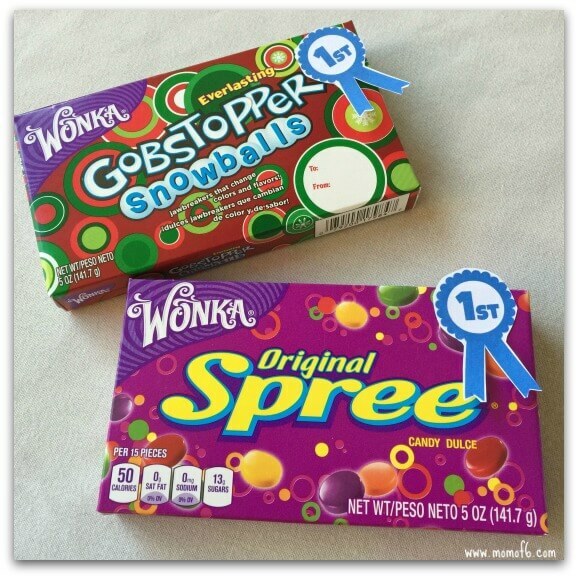 The favor tag is included in our party pack below! After the party, Alex used these thank you notes, which you are welcome to download and print for your own personal use. 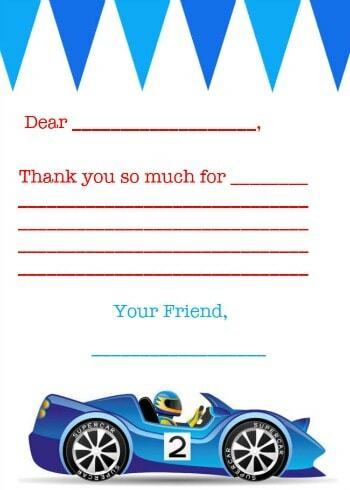 Would you like to download these Race Car Printables? 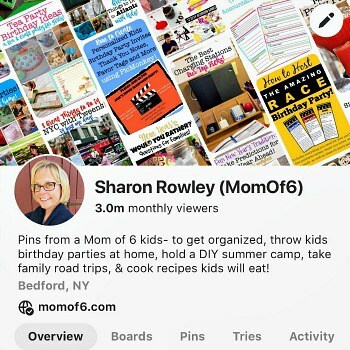 Simply sign up below to join the MomOf6 community and you'll be directed to a thank you page with access instructions! « Valentine’s Day Would You Rather Questions for Tweens! You are so very clever, Sharon. What great ideas you have! Although my kids would probably love a race track like this (as well as my husband! ), I don’t think it’d be used often enough to justify the high cost. 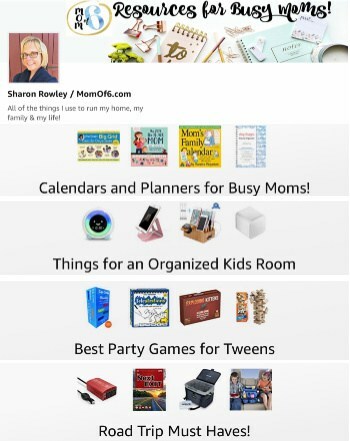 By the way, you’ve made PicMonkey sound so easy, I’ve just GOT to try it out some day soon! Yes- your kids would really need to be into the idea of car racing for sure. And it certainly helps when you can get grandparents and other family members to go in on it with you! And you DEFINITELY need to try PicMonkey. 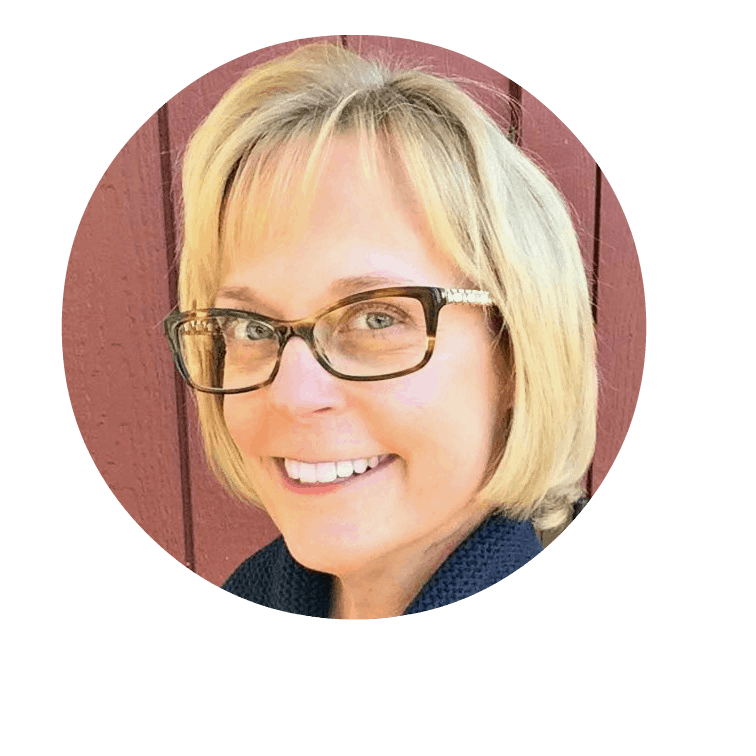 I use it literally every single day- for the blog as well as to edit images for my house, for scrapbooking, for kids school assignments. Seriously- it is the BEST!